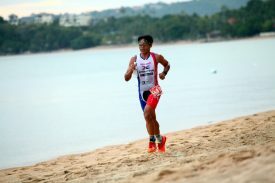 XTERRA welcomes the kingdom of Thailand to the World Tour on April 1 with the inaugural XTERRA Phuket off-road triathlon. February 16, 2017 (Honolulu, HI) – XTERRA welcomes the kingdom of Thailand to the World Tour on April 1 with the inaugural XTERRA Phuket off-road triathlon. Thailand’s largest tropical island is a well-known international destination for beach goers, serious divers, and road triathletes. And now, dirt lovers have the chance to experience its natural beauty too. XTERRA Phuket is the second stop of the 2017 XTERRA Asia-Pacific Tour and combines a 1.5k swim in the crystal-clear ocean of Layan Beach, with 30k of mountain biking and 10k of trail running in a stunning jungle setting. Henkens, who also produces trail runs, road triathlons, mud obstacle races, and Southeast Asia’s most popular adventure race, the River Kwai Trophy Adventure Race, said he’s most excited to share the famous Thai hospitality with the athletes visiting from around the world. “I’ve been wanting to produce a world-class XTERRA event here in Thailand for more than a decade now, and truly believe the market is ready for it,” said Henkens. At stake is $7,500 in elite prize money, age group slots to the XTERRA World Championship on Maui, and points in the Asia-Pacific Tour. Reigning Asia-Pacific Tour champion Ben Allen (AUS) is scheduled to compete, alongside his perennial APAC Tour rival Bradley Weiss from South Africa, up and comer Kieran McPherson from New Zealand and David Escobar Ballesteros of Spain, who won the XTERRA test event in Koh Samui this past September. Highlighting the women’s elite field is the reigning XTERRA Malaysia Champion Jacqui Slack of Great Britain, and the “Swiss Miss” Renata Bucher, who will be looking to add another title to her incredible string of 33 career championship wins. A sprint distance (750m swim, 20km MTB, 5km trail running), duathlon (5km Run, 30km MTB, 10km trail running) and 30K/10K/5K trail runs are also available, and entry to all events includes a gala awards dinner. Visiting athletes are encouraged to allow plenty of time to explore all that the island has to offer – its blue lagoons and gorgeous sunsets, diverse water sports, tropical gardens and Buddhist temples. The island boasts a vibrant nightlife and sensational cuisine from local street stalls to fabulous restaurants.